I always enjoy painting flowers. 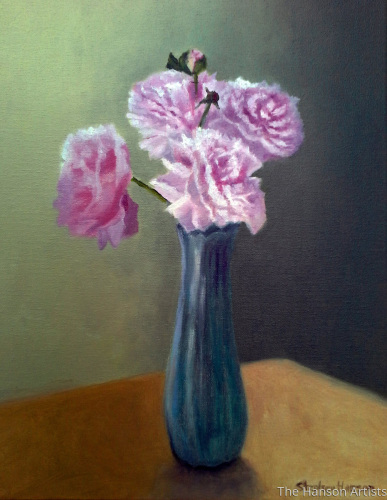 Here is a couple of Peonies that seemed to fit into a favorite vase of mine. 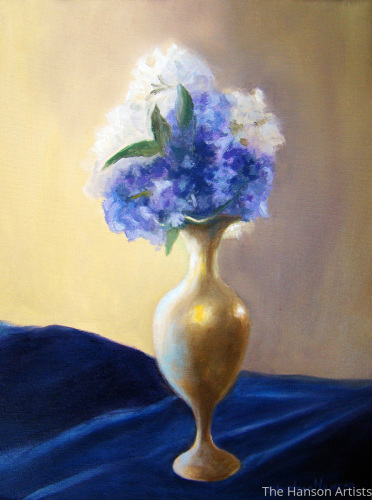 I've always liked lilacs. 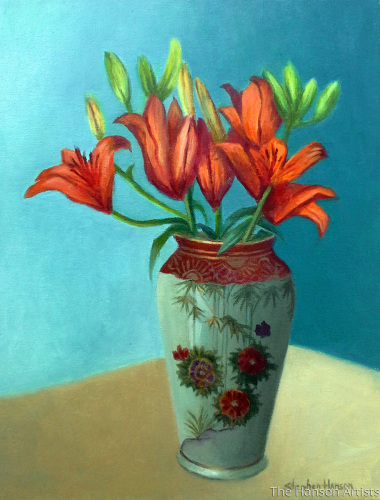 But their bloom comes and goes so quickly, so I had to paint this one very quickly. 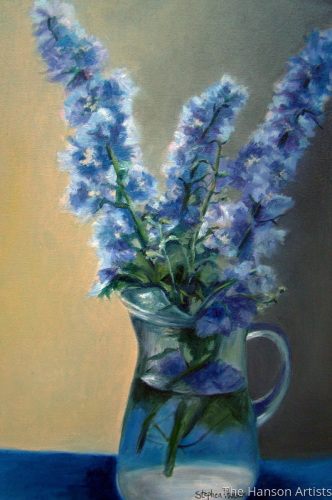 I wanted to do several paintings of lilacs since they come and go so quickly. This is my second from a few years ago. 6.75" x 5"8" x 6"9.5" x 7"10.75" x 8"12" x 9"13.75" x 10.25"
7" x 5"8.75" x 6"10.25" x 7"11.75" x 8"13.25" x 9"13.75" x 9.25"
This is a typical, classical arrangement that artists typically set-up for display to paint. 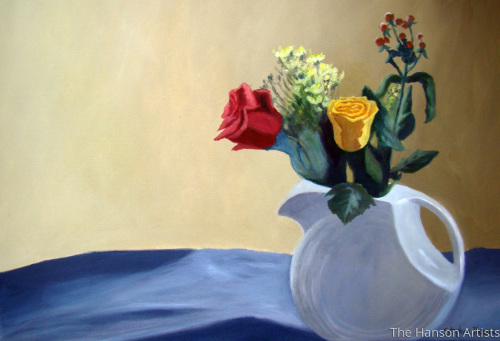 There are a myriad of different types of still life arrangements to paint. 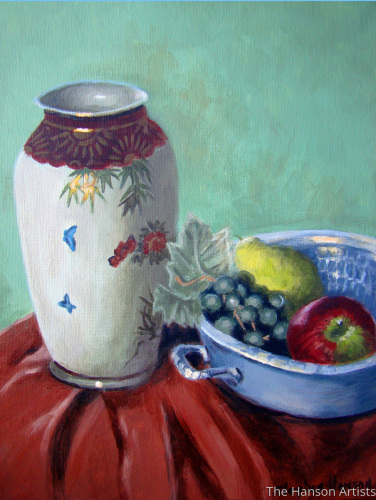 5" x 7"6" x 8.5"7" x 9.75"8" x 11.25"9" x 12.5"9.5" x 13.25"
Just a simple still life of an Asian vase with fruit. 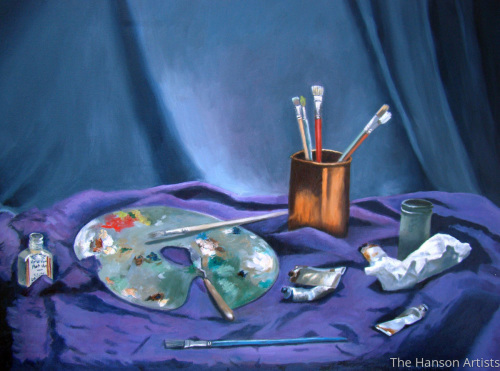 The artist finds what suits a particular painting at a given time. 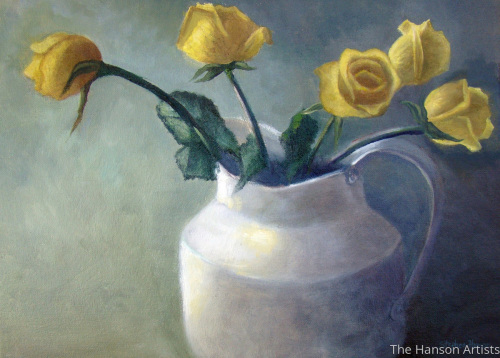 Roses in a setting, especially a white pitcher, seem to enhance each other, and make a fitting display for a painting. 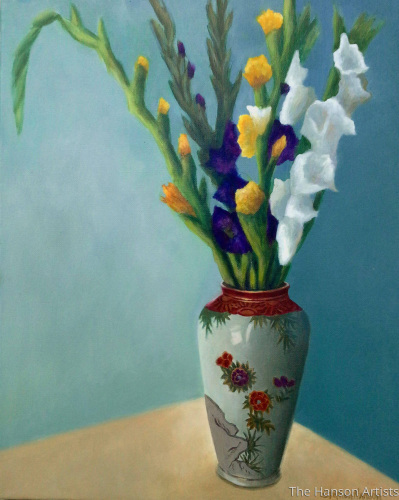 5" x 7"6" x 8.75"7" x 10.25"8" x 11.75"9" x 13.25"9.25" x 13.75"
Over the last few days I have been working steadily on this painting of Gladiolas. I had to work rather quickly as the blossoms change quickly. 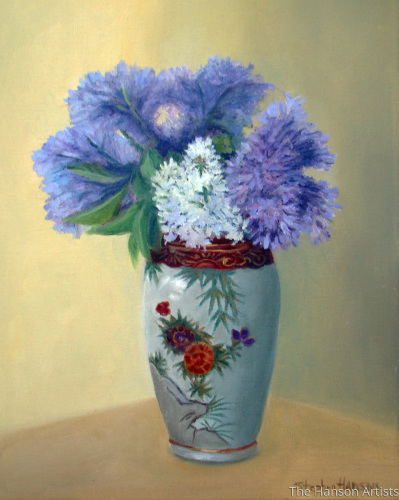 I enjoyed doing this one, as well as the vase. 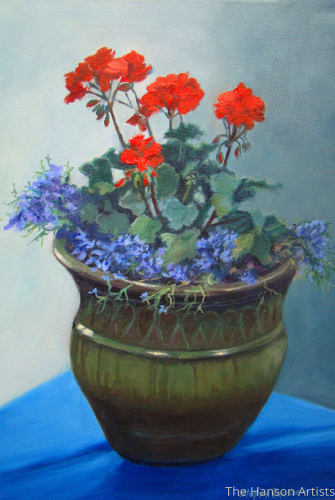 6.25" x 5"7.5" x 6"8.75" x 7"10" x 8"11.25" x 9"13.75" x 11"
A few years ago we had a wonderful display of geraniums sitting on our porch. 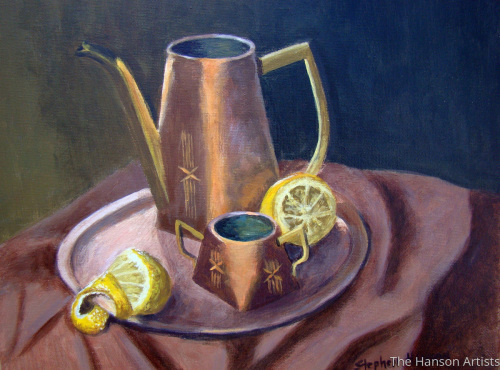 They basked in the sun, and eventually I realized that I needed to paint them, especially with green pitcher. 5" x 7"6" x 9"7" x 10.5"8" x 12"9" x 13.5"9.25" x 13.75"
These are some copper pieces that my grandmother had for many years. 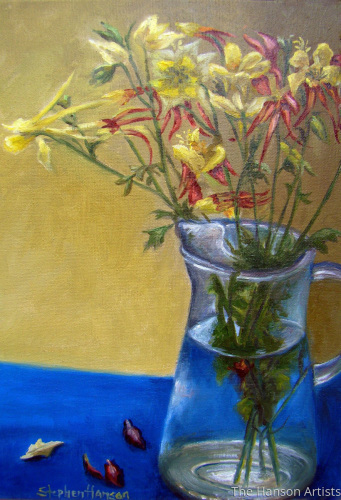 I acquired them, and have always enjoyed depicting them with their surface quality and reflections. Our neighbor had some beautiful Delphiniams in their yard a few years ago. I kept seeing them every day and just wanted to paint them. I knocked on their door and asked if I could pick to do a painting of them and of course they let me. 7" x 5"9" x 6"10.5" x 7"12" x 8"13.5" x 9"13.75" x 9"
I have been experimenting with another surface to paint on. 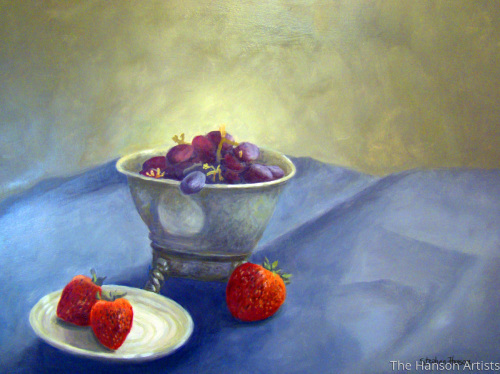 Here is a smaller painting of grapes placed in a silver container, with strawberries on a plate. 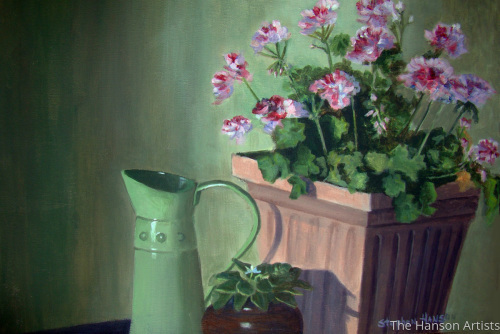 Another painting of geraniums that had been sitting on our back porch. This time they were a vibrant red in color. 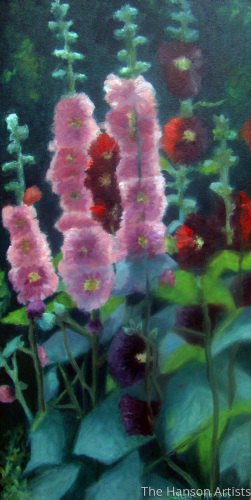 7" x 5"9" x 6"10.5" x 7"12" x 8"13.5" x 9"13.75" x 9.25"
This is one of three different hollyhock paintings that I've done over the last couple of years. I've always been drawn to their look. 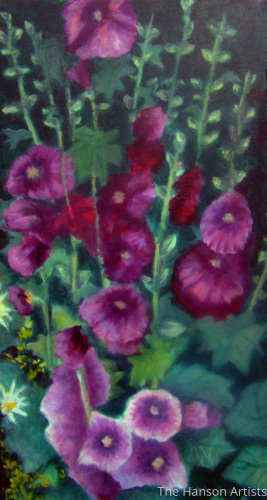 6.25" x 5"7.5" x 6"8.75" x 7"10" x 8"11.5" x 9"13.75" x 10.75"
A lady in Idaho asked me to do two different paintings of hollyhocks. She wanted them to be painted so that she could hang them side-by-side. This is the second one of them. 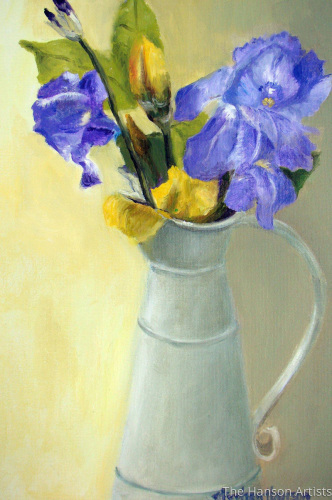 This has been the summer for Irises of all types and colors. I really enjoyed them this season. 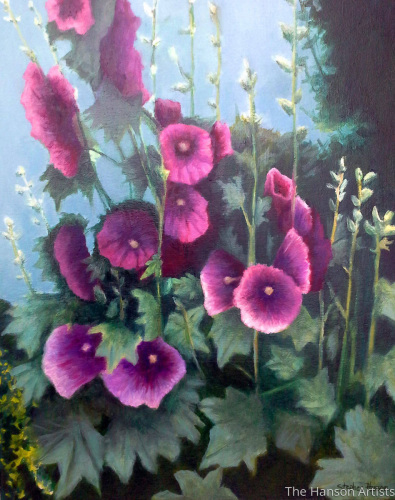 A lady in Idaho asked me to do two different paintings of hollyhocks. She wanted them to be painted so that she could hang them side-by-side. This is the first of two of them. 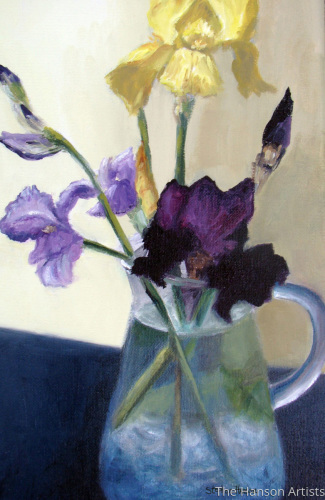 9.25" x 5"11.25" x 6"13" x 7"15" x 8"
A few years ago was a great summer for painting flowers, and the abundance of irises inspired me greatly. 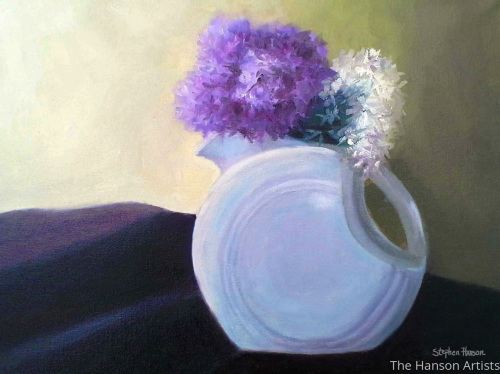 7.75" x 5"9.25" x 6"10.75" x 7"12.25" x 8"13.75" x 9"
I love painting the textures and colors of lilacs. 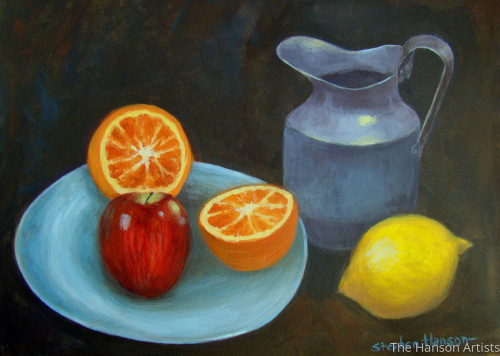 Here is another classical-theme painting of still life objects that have often been used by artists of the past. There are flowers blooming all around this summer. I love to see how the petals slowly open up and reveal the inside of the bloom. Here is another favorite object of mine that belonged to my grandmother. It is a beautifully-shaped decanter of some sort. 6.5" x 5"8" x 6"9.25" x 7"10.5" x 8"12" x 9"13.75" x 10.25"
I've always liked Peonies. I remember as a child admiring their beauty and elegance. 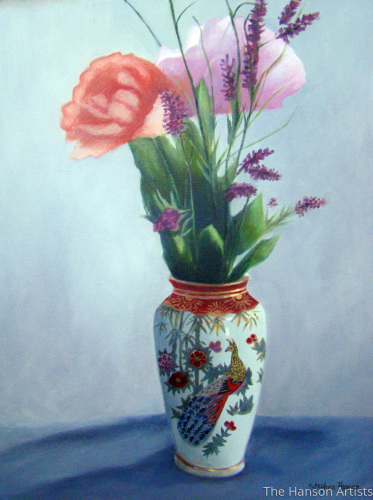 This is another one in a different type of vase I did. 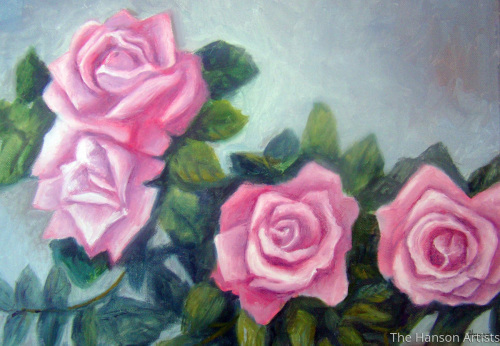 6.5" x 5"7.75" x 6"9" x 7"10.25" x 8"11.5" x 9"13.75" x 10.5"
Pink roses are equally as beautiful as those that are a deep red. I have found that they aren't quite as easy to paint as one might think, but if you can capture what they look like, then you've met the challenge. 5" x 7"6" x 8.75"7" x 10"8" x 11.5"9" x 13"9.5" x 13.75"
This time I decided to experiment with a different colored background. 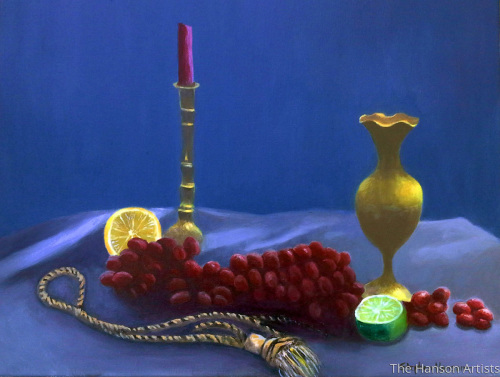 The color of a background can enhance or distract from the still life objects in it. 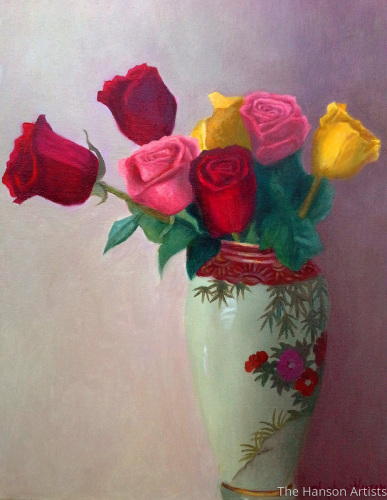 "Red, Yellow, & Pink Roses For a Blue Lady"
I love painting roses, but one needs to carefully observe their intricacies. 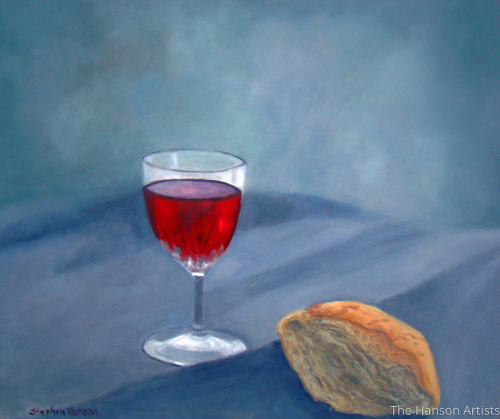 "The Wine and the Bread"
Just a simple painting of a glass of wine and a chunk of bread, to commemorate the remembrance of the body and blood of Christ. 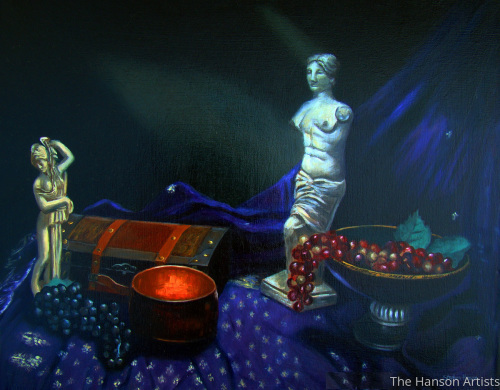 This is an oil painting I did a short time ago that commemorates the artists' tools. 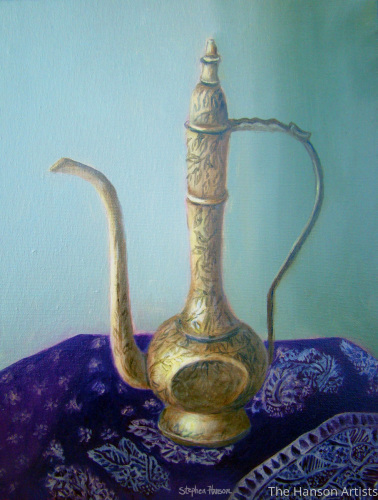 This is an oil painting that is 18" x 24" in size. 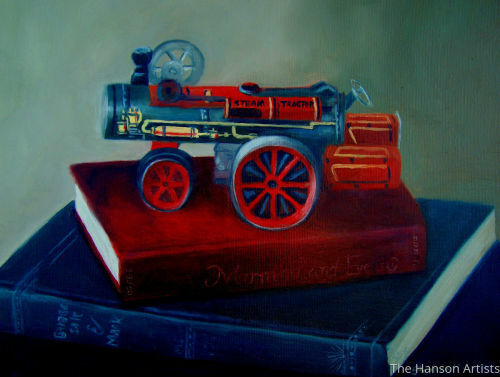 It is realistic and includes artist tubes of paints, brushes and other tools. We found this little metal toy at a garage sale a few years ago. It sat on the shelf for a while and then I finally decided to paint it. 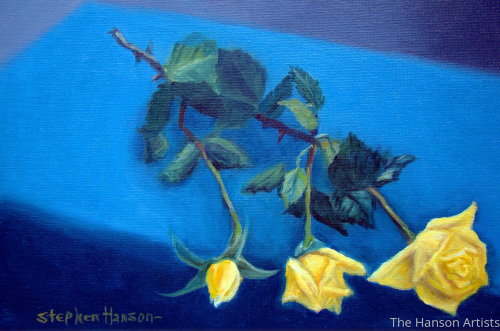 5" x 6.5"6" x 8"7" x 9.25"8" x 10.5"9" x 12"10.25" x 13.5"
Just a simple still life of some yellow roses that were in our yard a few years ago. 5" x 7"6" x 8.25"7" x 9.75"8" x 11.25"9" x 12.5"9.75" x 13.5"